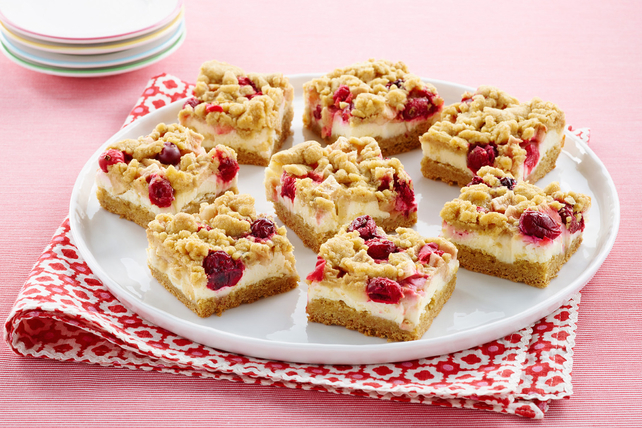 Bet you didn't know you could use a boxed cake mix to make a golden crust and crumble topping for hand-held dessert bars! Layered with a cream cheese filling and a medley of chopped apples and tart cranberries, these Apple-Cranberry Crumb Bars are delish! Line 13x9-inch pan with foil, with ends of foil extending over sides. Microwave butter in large microwaveable bowl on HIGH 1 to 1-1/2 min. or until melted. Add dry cake mix, 1 egg and cinnamon; beat with mixer until blended. Press 2/3 of the dough onto bottom of prepared pan. Beat cream cheese and sugar with mixer until blended. Add remaining egg; mix well. Pour over crust; top with fruit. Pinch small pieces of the remaining dough between your fingers; press lightly into cream cheese layer. Bake 45 to 48 min. or until centre is almost set. Cool completely. Refrigerate 1 hour. Use foil handles to lift dessert from pan before cutting into bars. When cutting the bars, wipe knife occasionally between cuts for cleaner edges. Place completely unwrapped packages of cream cheese in microwaveable bowl. Microwave on HIGH 30 sec. or just until softened.